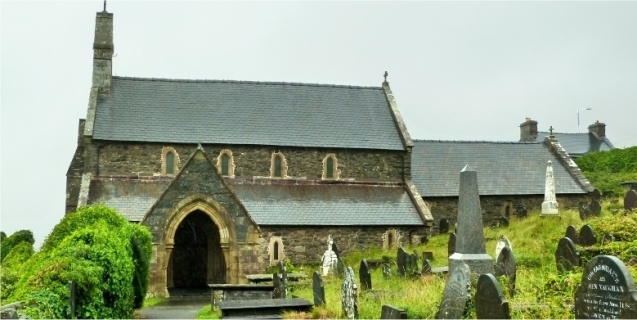 St Mary and Bodfans Church sits high on the headland to the north of Barmouth. When driving north toward Harlech it is well worth parking in the lay-by alongside the church and paying a visit to Saint Bodfans, one of the finest 13th-century churches in Gwynedd. It was built by Hywel ap Gruffudd ap Cynan, a great grandson of Owain Gwynedd who became overlord of this part of Meirionnydd in 1202 but was dead by 1216.The church houses the Llanaber stones dating from the late 5th-early 6th century AD. The plan of the church consists of a Nave, with north and south aisles, and a long and narrow chancel. Entering the church by the south Porch, rebuilt in the nineteenth century, the visitor notices the very fine south doorway, reputed to be one of the finest examples of Early English architecture in the country.